Presenting The Time Roads by Beth Bernobich. 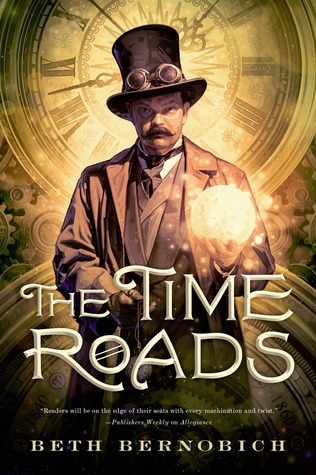 Steampunk, time travel, alternate history, The Time Roads boosts off many a qualities. A braided story into four parts, each telling a one big story relevant in four different situations. Revolving around the Éire Empire, which is clearly Ireland (in that world), i.e., Éire seems to be on top of the world, with the scientist looking towards achieving the mastery over time/ While there are some great elements to this story and with its braided style it is structured well but the heart of the matter I lost interest in it. The first thing that felt rather disconcerting was the time definition. The story ages in a single paragraph and sometimes on the same page too. Then, the presentation of the story. To change scenes spaces between paragraphs are used and it becomes tedious to sift after sometime since one story spans quite a big number of pages. It would have been so much better had they segregated each of the four stories into smaller chapters. Would have been loads better that way. Neater too. The abrupt endings of each stories also fazes us. The character development too felt dismal. It starts strong with Áine. She felt like a strong character at first, then out of nowhere , her father, the King dies. She is crowned Queen. There is the possible romance, which happens just like that. You have to pause and recollect everything that happened. One minute it looks like Áine will get together with her head bodyguard, the next second she is making out with the scientist when he is showing her his time travel experiment. With no development in chemistry before at all. Of course, the cover also doesn't seem plausible as well but if they were going for the 'father time' concept ,then well and good. It is a stunning one though. Then there is the part of time travel and the manipulation of time. Now this is the part, that was actually the well written part of the story. Each of the strands depict different scientific figures, who experiment and manipulate time. Be it to save a life, save a kingdom or worse yet to raze one such. Out of all the negatives, the elements pertaining to time were the only ones well written. The steampunk was too. Thus the author it seemed only focused on these two elements and somehow forgot to develop the other elements as well. "A well braided steampunk, time travel story with some major chinks in its armour"